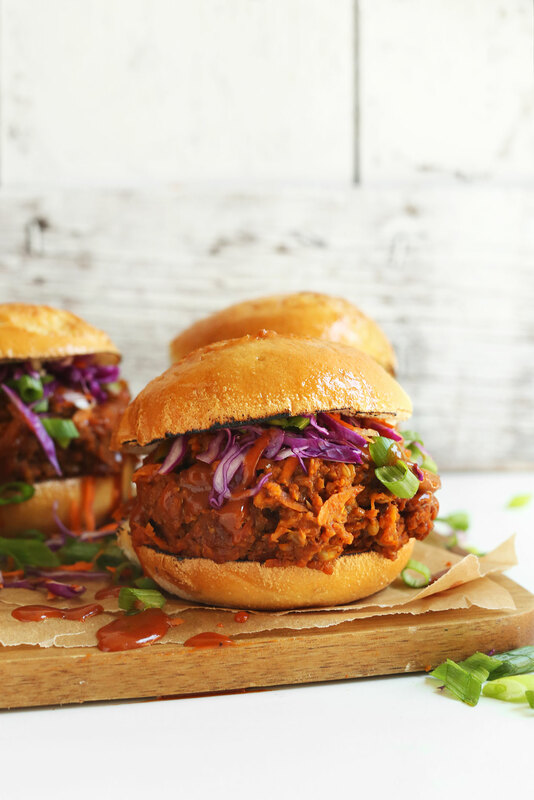 The Best Vegan ‘Pulled Pork’ Sandwich! Yep, this is happening. My latest take on vegan pulled pork that just may be my best yet. My first attempt at vegan pulled pork was successful after jumping on the jackfruit train. I loved it so much that I created a spicier version topped with grilled pineapple for our cookbook! Serious swoon. While I love using jackfruit as a vegan meat substitute, it has little to no protein. So after making my Vegan Sloppy Joes with lentils I was inspired to try a BBQ flavor. As you might’ve guessed, experimentation went well. This may be my favorite lentil recipe yet! This recipe is simple, requiring just 10 ingredients, and it comes together in less than 45 minutes! You likely have everything you need on hand besides BBQ sauce and buns (unless you’re like me and hoard these things in your pantry). To infuse the lentils and shredded carrots – which add that amazing, stringy texture – with flavor, I relied on smoked paprika, coconut sugar, garlic powder, and sea salt. A little BBQ sauce sealed the deal for that quintessential smoky BBQ flavor. Even better news? One of four sandwiches boasts 17 grams of protein, making this the perfect plant-based version that will truly satisfy those hearty pulled pork cravings. While this is delicious on its own, it would pair perfectly with my Perfect Grilled Corn with Sriracha Aioli, Garlicky Chickpea Kale Salad, and Ginger Beer Margaritas! If you give this recipe a try, let us know! Leave a comment, rate it, and don’t forget to tag a photo #minimalistbaker on Instagram. We’d love to see what you come up with. Cheers, friends! 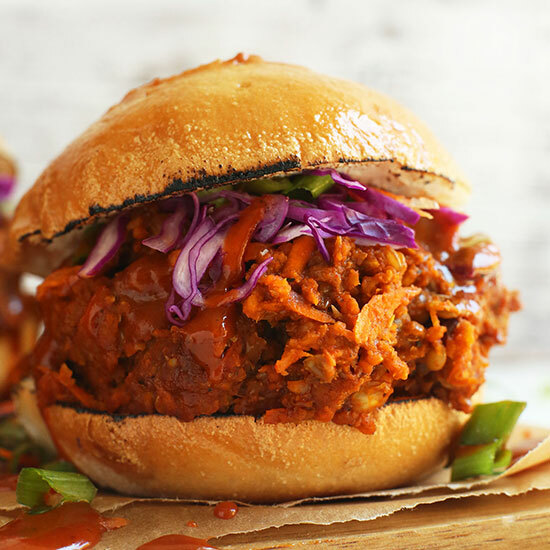 The Best Vegan 'Pulled Pork' Sandwich! 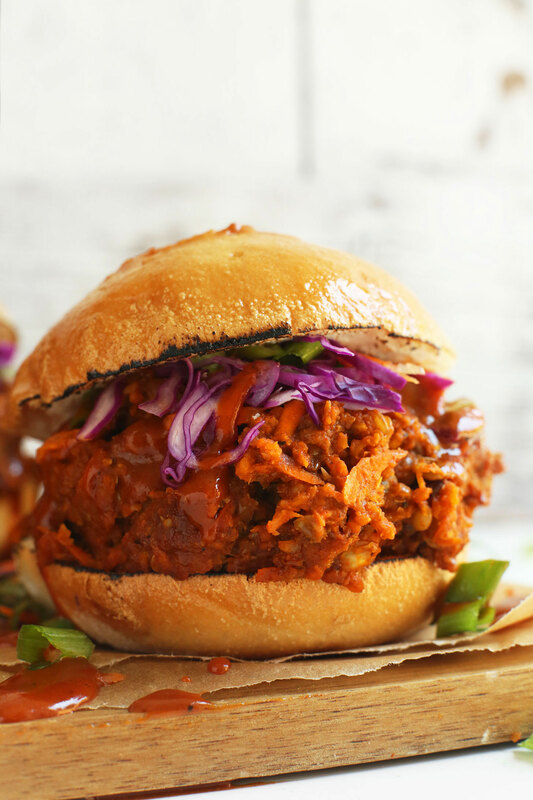 Healthy, 10-ingredient vegan 'pulled pork' sandwich with tons of smoky, sweet flavor and 17 G PROTEIN per serving! To a small saucepan, add water and rinsed lentils and heat over medium-high heat. Bring to a low boil, then reduce heat to a simmer and cook uncovered for about 18 minutes, or until tender. The water should have a constant simmer (not boil). Drain off any excess liquid and set aside. When the lentils are almost finished cooking, heat a large skillet over medium heat. Once hot, add oil and onion and season with a pinch each salt and pepper (amount as original recipe is written // adjust if altering batch size). Stir to combine, and sauté for 4-5 minutes, stirring frequently, or until the onions are tender and slightly browned. Next add cooked lentils, carrots, coconut sugar, paprika, garlic powder, salt, pepper and BBQ sauce (see photo). Stir to combine. Continue cooking the mixture over medium-low heat until completely warmed through and thick, stirring occasionally - about 5-10 minutes. Taste and adjust flavor as needed, adding more paprika for smokiness, salt for saltiness, coconut sugar for sweetness, or BBQ sauce for depth of flavor. Optional: Scoop half of the mixture into a food processor and (using the "s" shaped blade) mix/pulse to mash some of the lentils and carrots together. This creates a more cohesive texture, which I prefer. Serve the mixture on toasted buns of choice with toppings of choice. I went with shredded red cabbage, carrots, and sliced green onions. Serve with extra BBQ sauce for more flavor. Best when fresh, though lentil mixture will keep in the refrigerator up to 3 days. Reheat in the microwave or on the stovetop until warmed through, adding water if the mixture has dried out. *Most hamburger buns are naturally vegan. Just check the package to make sure there aren’t any animal products. The only brand of Vegan/GF buns I’ve liked are by the brand Happy Camper. I also like Udi’s, but they do contain eggs. Very good! I served over a rice / quinoa mix. First of all, let me say I am very reluctantly trying vegan recipes. A family member needed an abrupt change to her diet. Made this exactly as written. OMG! This is so unbelievably good! I’m still getting used to different textures, but this has more than enough flavor to make up for that. We’re so glad you enjoyed this recipe! Great! Thanks for sharing, Marla! I found out that my onion was bad while I was making this, but even without the onion this still turned out really delicious! And my bbq sauce was already sweet so it was fine with the sugar omitted. UM yes! At first, I put this in a tortilla and ate it. Then, when I had friends over for the Chief’s game I went ahead and blended it, spread it on a tortilla, and made pinwheels. Now I’m eating it on a bed of lettuce with Avocado. Whoop! We are glad you enjoyed this recipe, Lizzie! I made this and my husband and I loved it! He likes meat and yet said this is one of his new favorite dinners! Also serves well with hot sauce and pickles. I added about a tablespoon of peanut butter, which seemed to add to both the texture and the taste! Also some extra cumin and allspice, and I used Stub’s Barbeque Sauce (the best!). It was great on bakery hamburger buns with coleslaw. So good! And I’m not even a vegetarian…. I’ve made this for my Xmas party of vegans, vegetarians and meat eaters last year and everyone loved it! I just wanted to comment about the great addition of being able to customize serving amounts and how long and how to store leftovers. Since I have one stove and 30 guests, I have to prepare many dishes ahead, and knowing which dishes will taste just as good reheated the next day is invaluable in choosing my menu. Thanks for your fantastic site, talent, And sharing these amazing recipes. Yay! Thanks so much for sharing, Jane! We are glad that it was a hit! This is a repeat favorite in our house! My meat-eating husband can’t get enough, it is a great vegan alternative to the classic pulled pork sandwich! Yay! We are glad it has become a favorite, Allison! Honestly this was so perfectly done. Great texture and flavor. I was really wowed by how well this turned out. Plus my husband loved it! Will make again. I also did the half batch in food processor and it made it more of a meaty consistency rather than too beany! I haven’t made this yet, but have you tried dry-rubbing and smoking the carrots first? I’m trying to find a way to work this in alongside big batches of pork BBQ I make, as a way for the non-meat-eaters in the crowd to participate while incorporating the same smoky flavors. Obviously this would not adhere to the strictest of vegetarian/veganism tenets as it would be smoked in the same environment as the pork. I suppose I could make a batch with just the carrots on the smoker, but I’m wondering if you think it would be worthwhile. Smoking at 225-250 with hickory/applewood over a lengthy period might change the texture of the carrots from what you’re using for the recipe. We haven’t tried that and can’t say for sure, but if you experiment with it, report back on how it goes! Good luck! This was delicious, but we made one small addition; we added a a generous pour of bourbon a few minutes before serving! It really enhanced the smoky flavour and gave it an extra kick! This was so nice! Really filling, healthy and delicious! The only thing is that it definitely doesn’t taste like pulled pork, but nonetheless it’s a great dish that my omnivore mum loved too. I omitted the sugar and used an unsweetened homemade BBQ sauce. The colour was quite grey when I made this, has anyone got a suggestion for making the colour look a bit more like pulled pork? I am making this for our company cookout, and I have a question about how to store it/keep it hot. Ideally, I would want to put it in a crock pot to keep warm for a few hours after making it, but not sure how it will taste. What do you think? Should I freeze it the night before then put it in the crock pot that morning on low so that it has time to just warm up? Or do I make it the morning of and leave it in the crock pot on low until lunch time? I really want to do a good job with this since it is a BBQ and most people attending will be eating meat. What do you think would be the best option since I am unable to serve the dish right after it is prepared? Hi! You could even make it the night before and just refrigerate it until the next morning, then reheat! Just made this for dinner but left out the sugar because of the very sweet BBQ sauce – it was an absolute winner! Really basic ingredients and straightforward cooking method so a delight to make (and eat)! …I might give it a whirl. Where is the Jackfruit in the recipe? Very disappointing!!! I see lentils and BBQ but no jackfruit. ? You might be thinking of this recipe, Jenni! Hi! I made this awhile ago and SO GOOD! In fact, it’s so delicious it convinced me I need to finally buy a food processor! Do you know what would be the best way (if possible) to pre-make this? Ideally even freezing it first? I’m hosting a bbq for 300+ people and want to serve a vegan option that doesn’t break the bank! SOOOOOOO GOOOD!!! My boyfriend swore it was beef, that’s how good it was! (texture wasn’t 100% pork, but with a roll, cabbage on top, and a spot of guacamole, it was hard to tell since the flavor was spot on) I am making again this week, but tripling the recipe so we have leftovers this time. Thank you for such a great dish! I made this today and it looked like green pea mush, not pulled pork. :( Not sure what went wrong but very unappetizing looking IMO. I made a mistake…used green split peas instead of green lentils! OOps! This turned out really good and wasn’t that hard which is a big plus for me. I did make a couple subs. One thing is I used a tiny big of red lentils, didn’t have quite enough green to fill a cup, so topped off with red. Seemed to be fine and was mostly green anyway. This one probably change it a bit more, but I realized after I started cooking we were out of paprika, so improvised my own spices instead of the same amount. Chilli powder, Chipotle pepper, and Ancho pepper. Accidentally put a bit too much Chipotle, forgot how far it goes/how hot for second, but turned out good anyway. Definitely spicy, but my husband loved it. Would probably make it the same way again even once we restock the paprika. Though I am interested in what the original tastes like still. Also skipped the sugar. Our barbecue tends to be pretty sweet anyway, so figured it wouldn’t need it based on comments and found that to be true. It was plenty sweet (and I do like sweet) still. Delicious and has a great texture! I am not a fan of jackfruit versions of “pulled pork,” but I love this one with the lentils and carrots. Very good. No bun for me. I baked a sweet potato and loaded the BBQ mix on top with slaw and avocado on the side. Yum! This was sooo good! I made exactly as is with the exception of just a tad less brown sugar. I also doubled the recipe. LOVE. This really satisfies the BBQ meat flavor. I also made my own vegan coleslaw and added to the topping. This is a keeper. I am puzzled by the name of this dish. “Vegan Pulled Pork” As a vegan, why would you want to pretend to eat pork? I think it better to call it what it is. It looks wonderful!! ANOTHER A++ FROM MINIMALIST BAKER! Its killer, its omnivore impressive, its f**ken delicious, and so cheap! A CAN OF LENTILS? 2 CARROTS? Holy I am so impressed, I even broiled in the oven for some crispy bits, didnt even pulse in a blender just “smashed” with a fork a lil bit. You will not be sorry! DO IT NOW! HAVE THE HEALTHY PULLED PORK! This vegan is a happy camper. I have made this multiple times and I just love it. Thank you for the recipe! I made this last night and it was yummy! I made it exactly as called for and very much enjoyed it! As others noted, I felt that it was a bit too sweet though. Next time I will probably half the amount of sugar, and use a spicier BBQ sauce (mine was on the sweeter side), I also will add fresh garlic as I am partial to garlic! I also used the food processor for half the lentil mixture, and next time will process the whole mixture, not just half for more of a cohesive texture! This will definitely be a keeper at our house! Your recipe does not say smoked paprika. It just says “ground paprika.” Is that a mistake? Is it possible to use red lentils instead of green? Hi! Hannah! Normally no, as green lentils are firmer, and red lentils are softer and more mushy. But both would likely work in this recipe! I’m in heaven, what a wonderful recipe! Thank you ? This recipe sounds AWESOME! However, I am curious to know if this is a freezer friendly recipe? If so any other directions you would add – as far as how to prep for the freezer and how to reheat? Hi Brooke! We have not tried freezing it yet, I think it could freeze okay (but again, I have not tried it) If you give it a try, let me know how it goes in the comments! Made this for my family and loved it! It also made a great leftover sandwich for my work lunch. I have been wanting to make it again ever since finishing it off! Thanks for sharing. I am now inspired to try your other recipes! Hey! I made this today and it was soooo delicious! The texture is incredible and it’s very flavorful. The only thing I did differently was cook the lentils in vegetable broth to give them a deeper flavor. I fed this to my omnivorous family and everyone felt full and satisfied. Who needs pork?! This is so good! I put some vegan queso on top… OMG. Every recipe I try is delicious and my non vegan friends love it too! Thank you SO much Dana! Glad you loved it, Liz! Would this work in a slow cooker? I’m sure it would, but I’m a slow cooker novice and don’t know the process. Throw everything in at once (uncooked lentils?) and put it on high for a couple hours? It’s so hot where I live I don’t want to cook stovetop! Hi! You probably could, we haven’t tried it! Let us know how it goes if you do! Easy and delicious! I made this for a July 4th BBQ and it was a hit! I used a sweeter BBQ sauce so probably could have nixed the added sugar, as it was a little too sweet. For those of you who are oil-free – I water sauteed the onions to eliminate the oil and would doubt that it took any flavor away. The dish has a lot of flavor on its own. I will definitely make this again! Thanks, Dana! “Wow!” Thank you so much Dana! All of your recipes are great, but this one has just become my favourite. Not only is it made from easy ingredients (I used organic brown sugar), but it was super easy to make. It has just been given the big thumbs up in our house-which includes a fussy carnivore. Thank you, and as it has been said by other comments previously, you are a genius! ?? Hi Cara! We haven’t tried quinoa for this recipe, so if you do, report back on how it goes. I am not sure that it would work the same though. That being said, have you tried out our BBQ jackfruit recipe? It is similar in taste but doesn’t use lentils! This recipe was quite tasty! The family really enjoyed it with oven roasted potato wedges and a Cesar style salad on the side. I did pulse about 60 – 70%, vs. half, of the lentil mixture to make the lentils less obvious as not everyone in the family is a lentil fan. I also made a “lightly dressed” cabbage slaw (just a little vegan mayo, white vingar, S&P, and a pinch of sugar) to put on top of the vegan pork mixture. Delicioso! Well I made this tonight and while its not anything like pulled pork, I found it to be yummy. Made it with some tahini slaw with cabbage and radicchio and roast corn with her sriracha aioli… and I liked it all. My 2 sons not so much. So call it what it is, not pulled pork. Lentil and carrot on a bun with lots of flavor or something like that. I live in Israel and the selection of BBQ sauces is very small. There are Hunt’s and Heinz (a few of each brand, all brown) and a tomato based red BBQ sauce by a local brand. Which one should I use ? I don’t know how pulled pork tastes like. Hmmm, I’d probably go with the tomato based red by the local brand. The sauce should be smoky, spicy, and sweet. Hope that helps! It was so easy to make, so good to eat. Wow, where has this recipe been all my life. I’ve been vegetarian for the last year or so and had recently made the switch to vegan. Recipes like this make it much more interesting and fun. High protein content too, boom! Wish you were on YouTube as I find it easier to follow video recipes/instructions. Thanks for the recipe! Added about a tablespoon of cumin to add an earthy flavor. Next time I’ll cook a whole onion instead of a half, but the recipe is spot on for a veggie version of a family favorite dish. I just made this for dinner, and it was delicious! And super easy to make! Thank you! OH MY GOODNESS!!! I made this for me and my Dad this week. We both became Vegans just recently. One of the things that I have missed the most is BBQ. This is off the charts!!!! Thank you so much. I love your recipes. Wow! This was simply wonderful. I had to keep checking the recipe to make sure I wasn’t forgetting an ingredient because it seemed like it was almost too fast and easy to make. And the taste is just fabulous, I had to quickly put away the leftovers before I ate it all in one sitting. Definitely going to be a regular meal for me. Thanks again for coming up with such great recipes! WOW! So tasty! Each weekend I try a new recipe from you and each time I’m amazing… always delicious! I added apple cider vinegar to the mix to give it North Carolina flavor. I thought this tasted really good! I definitely think putting some in the food processor is a key step and was happy I did not skip that step. Next time I might try just putting the lentils through the food processor after I cook and drain them and then proceeding with the recipe. 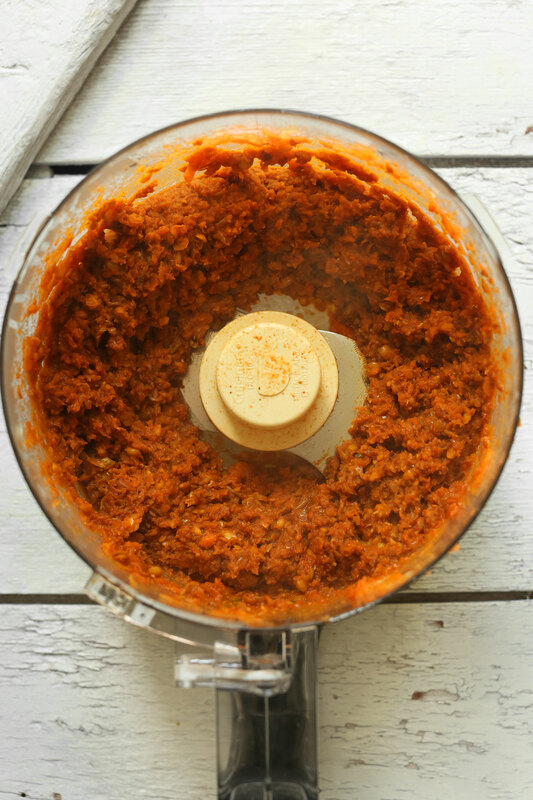 This way you have some ‘paste’ to hold everything together but you keep all the ‘stringy’ carrots to simulate the pulled pork texture. Will definitely make again. Wonder if the leftovers would freeze well? Hi Linda! I am so glad you enjoyed it! While we have not tried freezing it yet, I think it could freeze okay (but again, I have not tried it) If you give it a try, let me know how it goes in the comments! hi! I am looking at this recipe as an option for some vegetarian friends I have to feed. my question is, do you think this can be made ahead and frozen? Hi! I haven’t tried freezing it but I think it should work fine! If you try it, let me know how it goes! 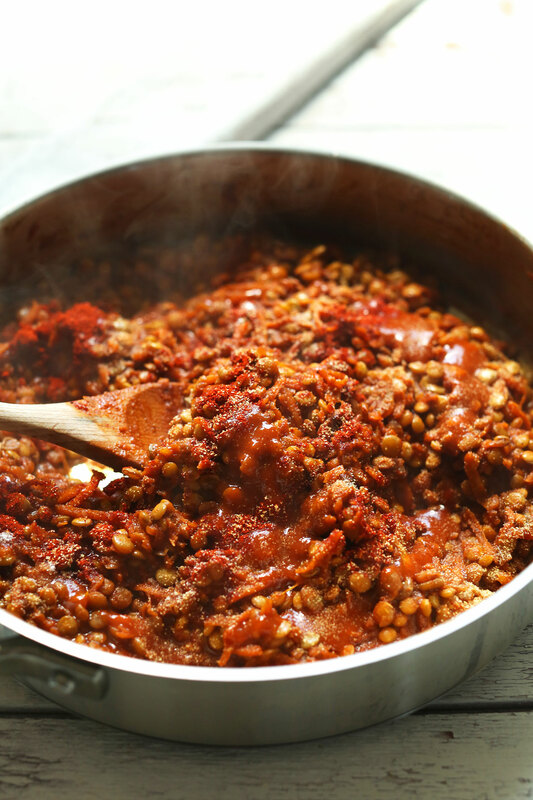 I made this with lentils and it was ridiculously good. We’ve already eaten it all. The key for me was not skipping the suggestion to blend some of the lentil/ carrot mixture. That made the texture so pulled pork like! And I just stuck my stick blender in a bit instead of transferring to a food processor. I will absolutely make this again and I’m going to try out your other recipes. Great recipe! This was delicuous.. I made this recipe with a spicy bbq sauce and it was AMAZING. It tastes exactly like how I remember pulled pork tasting and it has a similar look and texture!! I cannot recommend this recipe enough, and if you buy canned lentils, cooking time is twenty minutes. This recipe was really really good!!! I used to eat pulled porc sandwich as a guilty pleasure, once in a while at the local pub. Since I’ve quit eating meat, I haven’t bothered trying a vegan version of it. I’m really impressed with the result. No more guilt eating this, it is simply a pleasure!!!! I added a good layer of arugula and sauted oinion. DELIGHTFUL!!! Thank you for sharing this recipe!!! This is the best lentil “sloppy joe” or “pulled pork” sandwich I’ve made yet, and I’ve tried several! Even my young kiddos liked it. Thank you! I made it exactly as is, half in the food processor and then mixed together. I made this with for some friends and paired it with red cabbage and carrot coleslaw, and it was a great crowd pleaser! The recipe doubles really nicely, and I am looking forward to leftovers. We made these last night and I’m embarrassed to admit how many sandwiches I ate. I had par baked buns on hand so you bet those bad boys were on warm sourdough topped with the ripe avocado from my countertop. Wish I had some purple cabbage or a quickly slaw but they didn’t need it. My 2 year old and carnivore husband enjoyed them too. We’ll be having these again! I have made this a few times, and we really enjoy it! We prefer it when I put the whole mixture in the food processor and just pulse and taste regularly to be sure it doesn’t turn to paste. This is so much healthier than the processed seitan or soy that I used to use. Thank you! Hi Dana. It looks really very yummy! Thx for the recipe. Very yummy! I did not use the food processor to blend the mixture but still loved it. The recipe came together quickly and used items I had on hand. Perfect! We will certainly be making this again! Dana…again another amazing recipe! I made these for dinner and didn’t change a thing but decrease the sugar. My barbecue sauce was sweet enough! When I told my husband Sloppy Joes were for dinner he was excited until he looked in the pot and realized we weren’t having meat. He loved them needless to say and so did I! I just bought two more Vegan cookbooks, but I find myself just going to your site. Everything I’ve made so far has been scrumptious! Thank you for all you do! am I missing something here, there is no mention of Jackfruit anywhere in this recipe. Is the link wrong or am I not reading right? Nope, there’s no jackfruit in this recipe! Perhaps you’re thinking of our BBQ Jackfruit Sandwich? It’s not based with jackfruit! It’s lentil and carrot based. I just made this, and it was heavenly. Soooo good. I added alittle bit of ketchup to mine and used a hand blender. I going to make it again in the future and pair it with her recommendations. Dana, these are delicious. I feel like you’re my higher cooking self :) you’ve been a blessing ever since my family went vegan. My husband ate more tonight than I’ve ever seen him eat. When I asked him why he said “this is the closest thing to meat I’ve had in a long time!” We’ll be having this as a family staple. Thank you so much for your brilliance.. I’d be a bit lost without it! Ohmy GOD this was SO DELICIOUS! Seriously I can’t stop eating it. Definitely one of my favorites ever, the only differences I made was that I sautéd a few cloves of garlic in with the onions, and only used a bit of sugar. Also I believe smoked paprika makes ALL the difference, Sweet Baby Rays is my personal favorite BBQ sauce and went very well! Successs! Much appreciated. Third recipe I try from Minimalist, all very good, delicious. Oh my goodness! This is absolute deliciousness. Made it this evening to rave reviews. Next time, I might try serving with cole slaw. We’re vegetarian, not vegan, so I will go with a traditional mayo/cider vinegar dressing for the slaw. Thank you! Really enjoyed! I’m wondering, are the lentils supposed to be Al dentà? Because mine where a bit hard. Also I love all your recipes, but mine never look as pretty as yours. The colors are so vibrant on your posts, mine look drab. Still tastey just not as pretty. Hi Misty, the cooked lentils should be tender but still hold their shape if they’re cooked all the way through! Make sure the lentils are simmering so as to avoid the water cooking off before the lentils are finished cooking. This recipe is awesome! I made it for dinner tonight and it was so delicious. Thank you so much for your tasty, healthy and easy recipes! Amazing! THANK YOU for the lovely recipe. Dana I’ve made this a few times now and it’s a new favourite at our house! Is there a way that this could be made in the slow cooker do you think? I’m always looking for easy vegan slow cooker recipes that would be a cinche to throw together in the morning! I made this tonight and it was soooo yummy!!! The non-vegans approved too and my 5 year old gobbled it up. I would say that it was a bit too sweet due to the bbq sauce that I used, so next time I’ll leave out the sugar. This recipe is definitely a keeper. Already made this recipe twice and can’t say any more good things about it!!!! SO DELICIOUS. I made this for about 75 people at Reggae on the River. In the volunteer kitchen. Not being a vegan, but gluten-free I follow you. I gave you the credit. Everyone loved it. I liked it better than meat! I will be making this again. Yes, yes, and yes!! I used brown lentils and it looked and tasted wonderful! I might use 1 tsp ground paprika and 1/2 tsp smoked paprika next time. I put on toasted buns and served with corn on the cob. Delish!! Thanks so much for a great recipe! I’m going to freeze some next time for quick lunches! How did you get on freezing this recipe? Did it taste just as good once you’d defrosted it? Sorry Mollie, I didn’t have any leftovers the first time! I will be making it again and will post. I would think it would do just fine. Hi Mollie, I froze half the batch and they were still just as amazing! Do you know if green and red lentils are interchangeable in general? In general, no. Green lentils are firmer, and red lentils are softer and more mushy. But both would likely work in this recipe! Hi Anna, thank you very much for the recipe. It looks delicious. I was wondering if your recipes are all vegan. Are you not vegan? Tried this using what I had — instead of 1.5 cups carrot I used 1 cup of shredded carrots and 1 cup of shredded sweet potato. It was GREAT! Thanks! I made this last night and it was excellent! I added a little too much bbq sauce, so it was a little loose, more like a sloppy joe, but the flavor was great! Totally with you on the protein! LOVE using lentils in recipes. This probably has to be one of the tastiest BBQ recipes I’ve seen on the blog! Chilly day in PDX so this was a great lunch! Decided as vegan, I need more BBQ everything in life! !….request: can you try a BBQ baked beans recipe sometime? Love your food and vibe, keep on keeping on lady! I love how simple and satisfying this recipe is, like every recipe of yours that I’ve tried. I cooked the lentils with fresh chopped garlic and decided to forgo the addition of sugar since my Q sauce was packed full of it already. It was awesome! The first helping was on buns but the leftovers will be used in burrito bowls with red cabbage and kale. Another Minimalist Baker knock-out recipe! I made this yesterday and my husband (non-vegan but gluten-free) said it was one of the best sandwiches he’d ever had. Period. And I have to agree! I love how healthy this is, and the small amount of bbq sauce needed to give it flavor. Thanks for yet another fantastic recipe! Made this for dinner last night. The hubby and I LOVED it! And not at all complicated! I will be making this again and again! I do love my jackfruit barbecue, but you’re right, they aren’t very filling without protein. 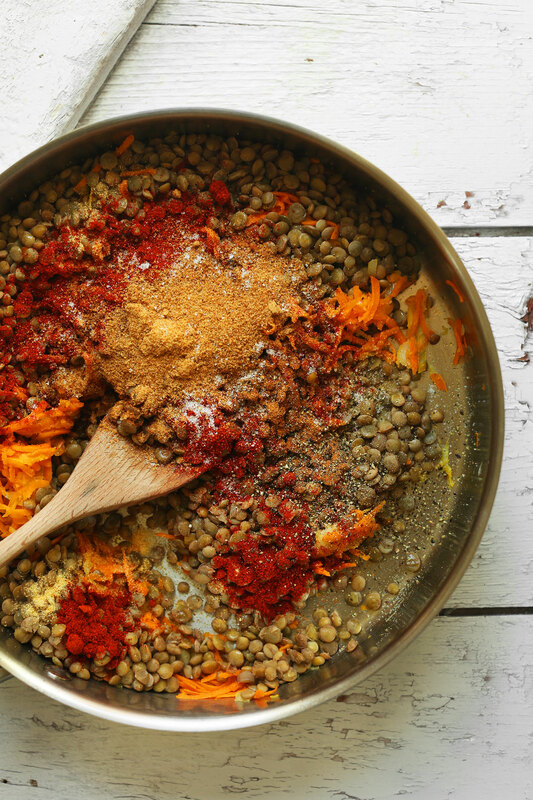 I love your lentil version and look forward to trying it!! Can you use brown lentils instead? Wowzers y’all, this is a great recipe! I made it earlier today, and it tastes even better now that it has sat around for a while. The only reason I am not giving this recipe five stars is because I changed a few minor things, and I wish I had followed the advice of one of the comments on adding the sugar at the end to taste. I used three fresh garlic cloves, crushed, and added them for the last five minutes or so of cooking. I cooked the lentils with a little salt, pepper and onion powder for extra flavor. As for the sugar, the sweetness really depends on your taste and the BBQ sauce you are using. Although it is delicious, it is alot sweeter than I would like. I think using the smoked paprika is a must! Carrots make the best pulled “pork” sandwich. One of the most popular recipes on my blog is a pulled BBQ carrot recipe. The texture is so close to the real thing, and when you add BBQ sauce, even non-vegans will love it. Already tried this recipe and it is a winner! Even my mother-in-law (not vegan) said it tastes just like pulled pork. You did it again Dana! Just made these. AMAZING! The only change I made was the addition of liquid smoke, and I cut the sugar down to 1 Tablespoon. THANK YOU, this will be a reoccurring recipe in our household! Eating this right now, sooooo good! We decided to go with a plant based menu for a month and kicked the month off with this tonight. Loved it! Served with sweet potato fries-perfection. Wonderful recipe! I made it today and even my vegan-suspicious husband asked for seconds. I’m looking forward to trying this! One question the ingredient list in the recipe includes “ground paprika” but in your description you mention smoked paprika; should it be 1 1/2 teaspoons of smoked paprika in the recipe? Thanks! Either works! I love the flavor of smoked. Just made these, they were honestly so amazing!! Very simple and easy to make and so so tasty ^-^ made them for my meat eating boyfriend and he thought they were beautiful! I agree with Laura. I made these last night and they were so easy and delicious! And my also meat-loving boyfriend went back for seconds. Thanks for the recipe! I’ll be making it again. I’ve got a pressure cooker and a bag of lentils, and have been looking for a recipe. Tonight’s dinner, perhaps! Thank you!!! Made these last night. I didn’t have any carrots (got ’em today in my CSA, of course! ), so I subbed the parsnips I needed to use up. Since they tend to be sweeter, I didn’t add any sugar except what was in my Trader Joe’s barbecue sauce. I loved it, and my meat-eating, pulled-pork-loving kid was impressed with it, too! Wow these look amazing, such a good idea to use carrots!! This looks damn yum… healthy and meat? Count me in! Made and devoured tonight. Husband and son loved it too. Def make again! I had it w sautéed green cabbage instead of on a bun. I made your BBQ jackfruit “pulled pork” this weekend and it was absolutely incredible! I have my non vegan family try it as well and they were awestruck! This came to my inbox today and I immediately decided to make it for dinner. Holy. Deliciousness. This recipe was spot on! My husband and I ate more than our fair share, that’s for sure! The only thing different that I did was use your vegan BBQ recipe from your cookbook.. Because it’s basically the best BBQ sauce ever. :) thanks for always sharing your amazing recipes. You make eating vegan so much fun! Lovely! Thanks for sharing, Janet! Greetings and thank you for your excellent work! I made the lentil sloppy joes and loved the flavor, but seemed to have trouble digesting the lentils. I’ve been mostly vegetarian for more than 30 years and have no problem with most legumes. Is there a way to cook lentils to make them easier to digest? I would love to try this recipe!! Seems soaking them for quite a number of hours might be your answer. Hi Dana, great idea! Going to make it this weekend! Are green lentils the same as puy lentils? No, not the same. Puy lentils are smaller and dark, almost black; green lentils are larger and – you guessed it – green. And puy lentils hold their shape quite well – probably not what you would want in this recipe. Is there a difference between smoked paprika and regular ground paprika? Yes, Allison, there is a difference. Smoked paprika imparts a delicious smokey flavour to a recipe. There’s also hot smokey paprika. Regular paprika is also known as “sweet” paprika, not because it is sweet, but because it is NOT hot. Wow, this looks so good! Can’t wait to try! Also, I may be one of few when I say this, but I totally appreciate any jackfruit or low-protein recipes you have. My son has PKU (and egg & peanut allergies) and is on a very low-protein diet. So, your creative lo-pro recipes are worth so much to those of us in the PKU community! Thanks for so many delicious meals we have enjoyed! Hi there, I just made this and it is quite good, so thank you. HOWEVER, I would highly recommend that the addition of the coconut sugar be left until the end, after you taste the mixture. I only used a scant tablespoon of it and I found it too sweet for my taste. I do realize, of course, that depending on the sweetness of your BBQ sauce, you may have to add the sugar, but for the brand I used, no added sugar would have been necessary. I did try to counter the sweetness with some lemon juice and then some sour cream, which worked. P.S. Hanna’s right: don’t confuse Jack fruit with durian – your nose will know the difference! If you’re going to try it with jackfruit, I would suggest “young” jackfruit. Oh my – this looks amazing! Can’t wait to give it a try! Hey Dana! These look bomb! Just wondering if you think it would dramatically alter the flavor of the mixture without the addition of the coconut sugar? I’m trying to avoid the addition of added sugars into my diet for the next few weeks. You could sub stevia! It does need a little sweetness though. Ohhh looking forward to making these! Just one question, if I took a shortcut and used the pre-cooked lentils at Trader Joe’s, how much should I be using of cooked lentils? Thank YOU! Just yes. All kinds of yes. This is just a eye opener Dana! What in the world is jackfruit? I’m slowly but surely getting more whole foods in my body, even though I still eat meat. I guess it’s the thought that counts, right? Gorgeous pics! Durian and jackfruit are actually different fruits. Durian is the really smelly one! Ripe ones make delicious desserts or we eat them fresh as fruits most of the time. Try quickly braise some shredded ripe nangka in palm sugar syrup, then put them on top of your greek yogurt…delish! While the green/young ones are perfect for cooking, GUDEG, a popular dish from Yogyakarta, Indonesia is my favorite! Durian on the other hand, it’s the ‘stinky’ fruit with sharp spiky other skin. P/S. Dana, thanks for your wonderful recipes! I have been enjoying making food more than ever. big love. Durian is a completely different fruit from jackfruit actually (though they do look kind of similar). Durian is VERY pungent, while ripe jackfruit tastes kind of like bubblegum. Feeding straight into my pulled pork addiction!